The temperatures are dropping and for the first time today I thought about starting the furnace. Ever the cheapskate, I will wait until it is no longer bearable, but this morning was a sign of things to come. Cold is on its way and that means trading in my salads and sandwiches for warmer, more hearty meals. Add to the falling temps that this fall my boys have both been in soccer and this means that Wedesday through Saturday we spend a ton of time at the soccer field. Of course, all of the practices and games fall right around dinner time so we have had to take that in to consideration when planning meals. The first week we were caught unprepared and did a whole lot of fast food. By the end of the week we all felt yucky and wanted nothing to do with burgers, pizza, or chicken nuggets. I realized that I needed to be planning better for my family. For me that meant preparing things that could be taken with us or be home cooking while we were at the field and ready as soon as we walked in the door. After one very unsuccessful venture with the "take it with us" theory we abandoned that and embraced the idea of slow cooker soccer night meals. Our dinner at the field was plagued by bees, which leads to screaming children that refuse to eat anything the bee may have even looked at. The first night we went the slow cooker route was wonderful. The kids were a bit hungry from the game, but when we walking in the door the whole house smelled wonderful and everyone was beyond ready to eat, and enjoy something home cooked. A success in every way as they not only ate a good, healthy meal, but thoroughly enjoyed it. Not to mention that this mom felt much better about providing that meal than the greasy bag of nasty I had provided on other such evenings. So, here we are talking about one of my two favorite kitchen items - the slow cooker. My husband has said that I may love this and my pizza cutter more than is normal. What is not to love? It cooks wonderful, moist food while I am doing other things - that's just genius if you ask me! And don't even get me started on my pizza cutters. I love them. I guess the fact that I own two slow cookers (and one mini one) and 4 pizza cutters may indicate the need for an intervention, but I just like to think that I am a woman that knows what she loves, right? Today I want to share fifteen tips for the most successful slow cooking. Temperature Tip: Remember that 1 hour on HIGH setting is equivalent to 2 hours on LOW setting, but all things aren't completely equal. Consider that foods cooked on low can cook a little longer than the recipe states without the risk of the food being overdone. Take your schedule into consideration and if you need flexibility you may want to stick with the low setting. Layer in Order: Because foods cook at different rates, always layer ingredients in the order given in the recipe. You only need to stir the ingredients if the recipe specifies. Control Liquid: Pour liquids over the top of them meat and don't fall to the temptation to add extra fluids. Stick with the liquids specified in the recipe when cooking roasts and stews. Let the natural juices do what they were meant to do. Cut the Fat: Trim excess fats from meats. Also remember that slow cookers don't brown food, so sear meats or poultry in a skillet for extra flavor, added eye-appeal, and to reduce excess fat. Just be sure to drain the excess before you toss it in the slow cooker. Thicken It Up: You can thicken juices and make gravy by removing the lid and cooking on HIGH setting for the last 20 to 30 minutes of cooking time. This simply lets some of the moisture escape through evaporation. It's an easy step that can make a big difference in some recipes. Perfect Veggies: Veggies generally cook slower than meats so place them under the meat in the slow cooker unless otherwise directed. They need the direct contact with the bottom and sides of the cooker in order to be ready at the same time. Perfect Timing: Dairy and seafood tend to break down when cooked for an extended time so you want to wait until the final hour to add seafood ingredients and the final 15 minutes of cooking to add dairy (like milk and sour cream). So, unless otherwise specified by the recipe, go by this rule. No Peeking: Just like under the Christmas tree, no peeking is allowed! When you peek it lets lots of the steam (and therefore heat) escape and it can take 20 to 30 minutes for the heat to build back up to the previous temperature after removing the lid. So don't be tempted to take a peek inside the cooker before its finished. Fresh Is Best: As with any cooking, fresh herbs and spices are generally better than the dried variety for extended slow-cookin' times because they take longer to release their flavors. When using dried herbs , opt for whole rather than crushed or ground. Let the time and the flavor work together in your favor. Beautiful Beans: Soak dried beans before adding them to the slow cooker. Then add sugar and acid only after the beans have cooked until tender. Dried beans take longer to tenderize if combined with sugar and acid before softening. Timing will make a tremendous difference. Age Isn't All Relative: Did you know that new slow cookers tend to cook at higher temperatures than older models? I bet you knew this if you have purchased a new one recently. My first few recipes after replacing the old wedding gift slow cooker had less than fabulous results! If you're using a new model, check for doneness at the lower end of the time range. If your cooker tends to boil contents, check for doneness a little early. All Sides Are Not Created Equal: Sometimes slow cookers have hot spots - where one side cooks hotter than the other. If you see this happening with yours simply rotate the insert halfway through the cooking time. This same technique also allows for even browning of cobblers and crusts. Perfect Balance: Fill your slow cooker at least half-full but no more than two-thirds full. This helps keep the temperature of the food even. Safe Zone: To prevent meat, poultry, or seafood from sitting to long in the danger zone of temperatures, defrost any frozen foods before cooking. This makes sure that the contents of the crock reach a safe temperature quickly and cooks them more evenly. 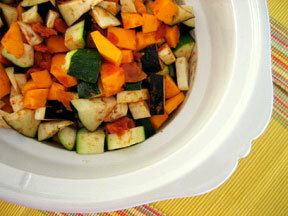 Keep Cleanup Easy: First, let the slow cooker insert cool completely before washing it. Running cold water over a hot insert may cause it to crack. Another huge advance in slow cooker cleanliness are the clear liners you can purchase at the grocery store. Similar to roasting bags, the bag is placed in the cooker before any food goes in. After cooking, once everything has cooled, you simply lift them out and throw away the bag and all the mess! If you are not using a liner, be sure to coat the inside of the cooker with cooking spray for easier cleanup. This fall warm up with some fantastic food, cooked to perfection in your slow cooker. And, if you love your slow cooker like I love mine, send me a note so I know I am not alone! Happy cooking!